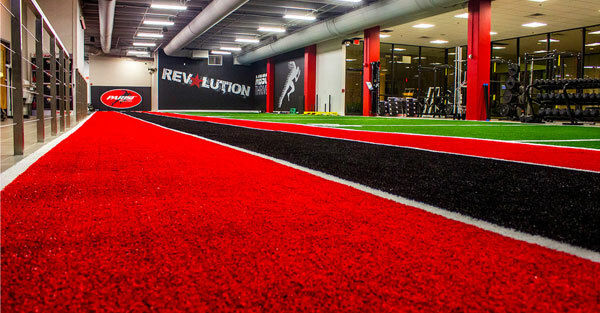 At SYNLawn®, our turf designers heeded the call of athletes demanding a durable, versatile flooring surface that can withstand the rigors, dynamism and explosive energy of their workout sessions. Our Vancouver synthetic turf and artificial grass experts have spent time creating two floor turf applications for gymnasiums, indoor and outdoor tracks, weight rooms, and agility training locations: SpeedTurf™ and TrackTurf™. Both of these products are specifically engineered to absorb impact, decrease common athletic injuries and increase performance levels. SpeedTurf™ and TrackTurf™ are high-quality synthetic turf products that are suitable for installation in commercial and residential areas. Both applications feature 5mm foam-padded backing that holds up against everyday wear and tear, as well as heavy foot traffic, allowing you to focus on the efficacy of your workouts. The infill beneath the top layer is soft, yet sturdy to give athletes the chance to develop their performance with minimal muscle fatigue and maximum comfort. SpeedTurf™ and TrackTurf™ are constructed with a distinctive blend of nylon and polyethylene. This combination results in a more forgiving, less abrasive top layer that improves on strength and agility training turf flooring products that are made from only nylon. This polyethylene/nylon blend reduces friction, creating an ideal surface for strenuous workouts with heavy equipment, such as sleds and other weight- and cross-training equipment. In and around Maple Ridge, Abbotsford, Burnaby, Mission, Richmond, Langley, Surrey, and Vancouver, our synthetic turf products are loved by both amateur and professional athletes! If you would like to learn more about TrackTurf™ and SpeedTurf™, please call SYNLawn® at 778-999-6492 or 778-246-2210 today for further details. 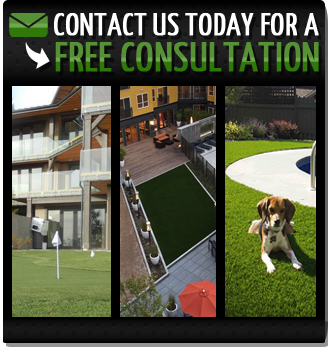 Alternatively, you can contact us online for a FREE turf installation consultation! Our artificial lawns, agility training and track turf, golf putting practice greens, and synthetic dog grass turf runs are 100 percent recyclable.